US Cities are abandoning recycling efforts because it's too costly. And China no longer accepts even our sorted garbage. The Wall Street Journal reports Aluminum Makers Ditch Can Business. Arconic Inc. and other aluminum rollers are producing less sheet for beverage cans and more higher-margin, flat-rolled aluminum for automotive and industrial components. Prices for used aluminum cans in the U.S. have fallen about 30% since last summer. Old cans are less versatile than other scrap. The makers of airplane and car parts prefer not to use aluminum made from recycled cans. More new cans in the U.S. are made from imported aluminum. “We’d prefer to purchase domestic can sheet, but as of right now there is not enough to supply the domestic market,” said Jamie Westfahl, senior director of global packaging procurement for Denver-based brewer Molson Coors Brewing Co. The glut of used cans shows how public calls for using more recyclable materials can fall short if companies decide it isn’t profitable enough to remake them into new products. As a matter of "national security", tariff man Trump put huge tariffs on steel and aluminum when, despite the tariffs, the US does not produce enough sheet aluminum to supply demand. "Scrap paper and plastic prices have collapsed since China imposed higher standards on the purity of those products imported from the U.S. China implemented tariffs of 50% last year on aluminum scrap from the U.S. That has created a glut of shredded scrap from junked cars in the U.S. to mix with the growing stockpile of discarded cans." "About 70% of imports last year came from China despite the 10% tariff the Trump administration levied on imported aluminum last March." The Atlantic asks Is This the End of Recycling? “We are doing our best to be environmentally responsible, but we can’t afford it,” said Judie Milner, the city manager of Franklin, New Hampshire. Since 2010, Franklin has offered curbside recycling and encouraged residents to put paper, metal, and plastic in their green bins. When the program launched, Franklin could break even on recycling by selling it for $6 a ton. Now, Milner told me, the transfer station is charging the town $125 a ton to recycle, or $68 a ton to incinerate. One-fifth of Franklin’s residents live below the poverty line, and the city government didn’t want to ask them to pay more to recycle, so all those carefully sorted bottles and cans are being burned. Broadway, Virginia, had a recycling program for 22 years, but recently suspended it after Waste Management told the town that prices would increase by 63 percent, and then stopped offering recycling pickup as a service. “It almost feels illegal, to throw plastic bottles away,” the town manager, Kyle O’Brien, told me. 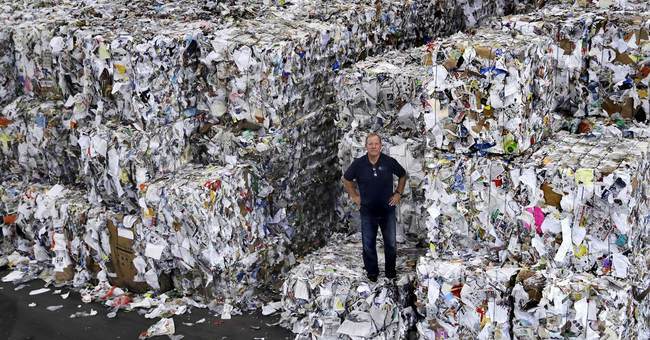 Without a market for mixed paper, bales of the stuff started to pile up in Blaine County, Idaho; the county eventually stopped collecting it and took the 35 bales it had hoped to recycle to a landfill. The town of Fort Edward, New York, suspended its recycling program in July and admitted it had actually been taking recycling to an incinerator for months. Determined to hold out until the market turns around, the nonprofit Keep Northern Illinois Beautiful has collected 400,000 tons of plastic. But for now, it is piling the bales behind the facility where it collects plastic. The Atlantic notes the same thing is happening all over the country at a time when the United States is creating more waste than ever. In 2015, the most recent year for which national data are available, America generated 262.4 million tons of waste, up 4.5 percent from 2010 and 60 percent from 1985. That amounts to nearly five pounds per person a day. New York City collected 934 tons of metal, plastic, and glass a day from residents last year, a 33 percent increase from 2013. One problem is Americans attempt too much recycling. Because of all the recycling campaigns, people feel guilty about throwing away anything. Plastic bags that cannot easily be recycled get thrown the recycle bin. They jam sorters. People don't distinguish between aluminum and steel. People don't distinguish between greasy pizza boxes and clean paper. We now need a massive publicity effort to tell people if in doubt, don't recycle. Is Trump to blame for the recycling failure? It's possible. The answer depends on whether or not China stopped importing sorted US garbage in response to Trump tariffs. If so, perhaps China can be persuaded to once again take US garbage once a deal with China is worked out. Regardless, we need a new recycling slogan. I propose "If In Doubt, Don't Recycle." That's the appropriate campaign whether or not China accepts US garbage or not. Perhaps they have stopped, not because of Trump, but because there is too much garbage in our supposedly sorted garbage. Somehow I doubt my slogan will fly in California. Instead, they will seek higher taxes.